GaryMoller.com - Health, Fitness - Naturally! : Cycling Study: Why did females who ingested protein complain of sore and tired muscles during the sessions? Cycling Study: Why did females who ingested protein complain of sore and tired muscles during the sessions? Woman running on empty: A seriously depleted nutrient base. The study that is reported below this commentary found that female cyclists suffered discomfort and loss of performance the days after ingesting a mix of protein and carbohydrates following an exhausting endurance cycle as compared to a carbohydrate only intake; whereas their male counterparts in the study had a 4% improvement as compared to men who had the carbohydrate only intake. Speculation is that the differences in protein digestion and metabolism between the male and female test subjects is probably due to differences in hormonal dominance. While this may well be the case, I tend to think that hormones do not have all that much of an influence. I think the answer is a lot simpler and to do more with the generally poor state of nutrition of many young and not so young women. This is especially so for women who participate in endurance sports like cycling and running. 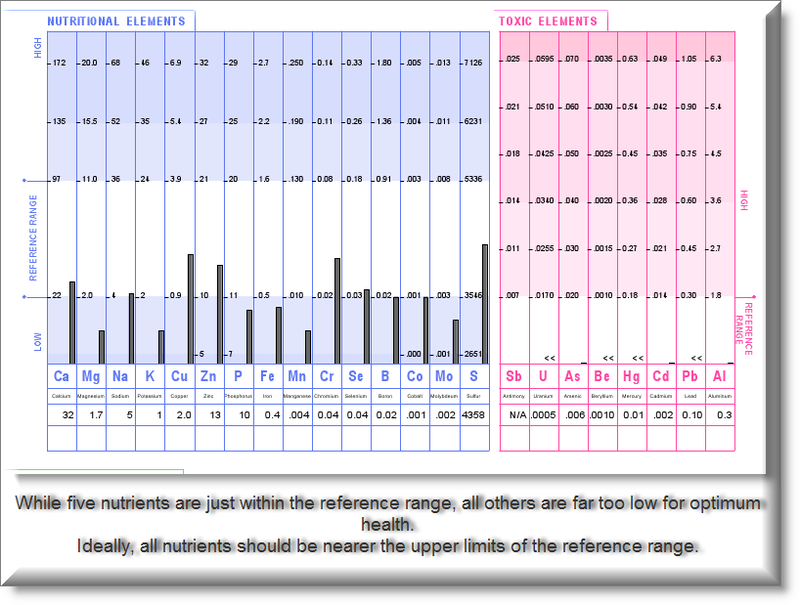 When a Hair Tissue Mineral Analysis (HTMA) is carried out on a young woman it is not in any way unusual to get a result similar to what is seen in the nutrient chart at the top left of this article. In fact, this is a common finding. A nutrient profile such as this one is indicative of a person who is running on empty - sustained only by a steady supply of low nutrient carbohydrate foods like breakfast cereal, fat free yogurt and rice crackers. While she may be in a precarious nutritional status this may not be obvious to the untrained observer and she may even be a top performer in sport. But she won't last for long. Analysis of her diet will typically reveal that she is partially or fully vegetarian, she may have developed some food intolerances, such as to lactose (milk sugar) which is hardly surprising, given the deluge she may have been getting in her diet as a child and young adult). Digestion for a nutrient depleted female, is generally poor. This is because her starved state has her in a near state of metabolic hibernation and this includes the digestive system. Her digestion desperately tries its best to do the job; but her stomach will fail to produce sufficient stomach acid and what is produced is of a poor quality. The same will be the case with the pancreas which produces digestive enzymes. Being on a low fat diet, the release of bile from the gall bladder is erratic and the bile will again be of a poor quality. This all amounts to poor digestion. Especially if she adds a constant deluge of bottled water, Diet Coke or blue/red/orange Powerade! Furthermore, the digestive tract is remarkably intelligent: It learns to anticipate the foods its owner eats daily and adjusts accordingly. If the diet is chronically lacking in protein and fat, then the digestion adapts by not producing as much of the digestive juices needed to digest these dietary items. During exercise digestion progressively shuts down as intensity increases and as exhaustion sets in. If protein is ingested within a few hours of this exercise, the protein may pass relatively undigested. It is therefore hardly surprising that the women in this study suffered discomfort and loss of performance after ingesting a protein supplement following cycling to exhaustion. The men in the study, on the other hand, fared better probably due to having somewhat better digestive health and being more used to protein in the diet. Several years ago, Dr. David Rowlands, a senior lecturer with the Institute of Food, Nutrition, and Human Health at Massey University in New Zealand, set out to study the role of protein in recovery from hard exercise. He asked a group of male cyclists to ride intensely until their legs were aching and virtually all of their stored muscle fuel had been depleted. The cyclists then consumed bars and drinks that contained either mostly carbohydrates or both carbohydrates and protein. Then, over the next few days, they completed two sessions of hard intervals. One took place the following morning; the next, two days later. Dr. Rowlands found that the cyclists showed little benefit during the first interval session. But during the second, the men who ingested protein had an overall performance gain of more than 4 percent, compared with the men who took only carbohydrates, “which is huge, in competitive terms”, Dr. Rowlands says. Other researchers’ earlier studies produced similar results. Protein seems to aid in the uptake of carbohydrates from the blood; muscles pack in more fuel after exercise if those calories are accompanied by protein. The protein is also thought to aid in the repair of muscle damage after hard exercise. Dr. Rowlands’s work, which was published in 2008, was right in line with conventional wisdom. Not so his latest follow-up study, which was published online in May in the journal Medicine and Science in Sport and Exercise and should raise eyebrows, especially lightly plucked ones. After his original work was completed, Dr. Rowlandssays, “we received inquiries from female cyclists”, asking to be part of any further research. So, almost as an afterthought, Dr. Rowlands and his colleagues repeated the entire experiment with experienced female riders. This time, though, the results were quite different. The women showed no clear benefit from protein during recovery. They couldn’t ride harder or longer. In fact, the women who received protein said that their legs felt more tired and sore during the intervals than did women who downed only carbohydrates. The results, Dr. Rowlandssays, were “something of a surprise”. Scientists know, of course, that women are not men. But they often rely on male subjects exclusively, particularly in the exercise-science realm, where, numerically, fewer female athletes exist to be studied. But when sports scientists recreate classic men-only experiments with distaff subjects, the women often react quite differently. In a famous series of studies of carbo-loading (the practice of eating a high-carbohydrate diet before a race), researchers found that women did not pack carbohydrates into their muscles as men did. Even when the women upped their total calories as well as the percentage of their diet devoted to carbohydrates, they loaded only about half as much extra fuel into their muscles as the men did. Why women respond differently seems obvious. Women are, after all, awash in the hormone estrogen, which, some new science suggests, has greater effects on metabolism and muscle health than was once imagined. Some studies have found that postmenopausal women who take estrogen replacement have healthier muscles than postmenopausal women who do not. Even more striking, in several experiments, researchers from McMaster University in Canada gave estrogen to male athletes and then had them complete strenuous bicycling sessions. The men seemed to have developed entirely new metabolisms. They burned more fat and a smaller percentage of protein or carbohydrates to fuel their exertions, just as women do. What all of this emerging science means for women and the scientists who study (or ignore) them is not yet completely clear. “We need more research” into the differences between male and female athletes, Dr. Rowlands says. In his own study, a particularly intriguing and mysterious finding suggested that the female cyclists somehow sustained less muscle damage during the hard intervals than the men did. Their blood contained lower levels of creatine kinase, a biochemical marker of trauma in muscle tissue. Did estrogen protect the women’s muscles during the riding? And if so, why did the female cyclists who ingested protein complain of sore and tired muscles during the sessions? “Honestly, I don’t know,” Dr. Rowlands says, adding that he does not think that his findings suggest that women should skip protein after exercise. “It’s true that we didn’t see evidence for a benefit,” he says. But his study was one of a kind. The findings need to be replicated. In the meantime, female athletes should view with skepticism the results from exercise studies that use only male subjects. As Dr. Rowlands says—echoing a chorus of men before him—when it comes to women, there’s a great deal that sports scientists “just don’t understand”.